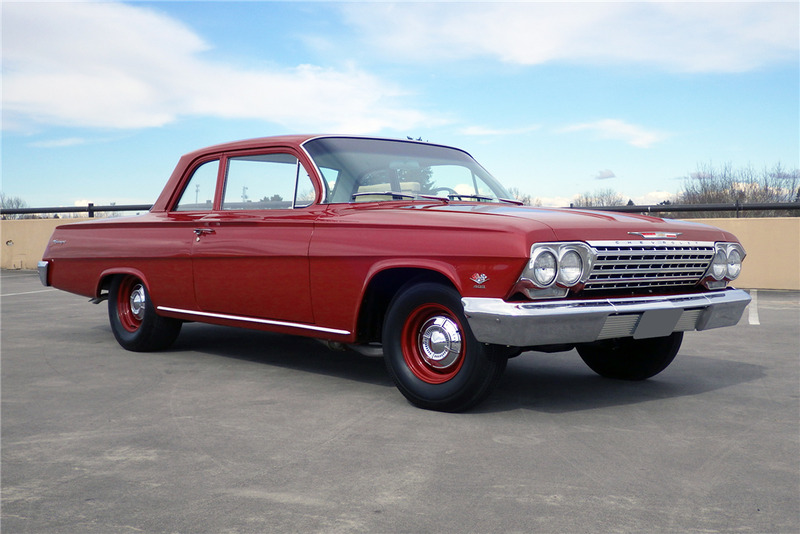 This 1962 Biscayne is an AACA Grand National First Place award-winner and Senior First Place award-winner, and is a magazine feature car. It’s powered by a professionally built 409/409hp engine with correct dual 4-barrel carburetors, backed by a BorgWarner T10 4-speed manual transmission and 4.56 ratio posi-traction rear end. It has been rotisserie-restored and finished in Honduras Maroon over a Fawn interior with new upholstery, carpet and headliner, refinished dash and trim, tachometer with sun transmitter, and radio and heater delete option. It has a highly detailed undercarriage in red oxide and rides on standard steel wheels with poverty caps and period-correct reproduction tires and spare. This Biscayne was sold new at Bud Eyre Chevrolet in Ridgecrest, CA, on August 10, 1962, and remained with the original owner until 1987. The original Protection Plan booklet, manuals, past registrations, magazines and original California Black Plates with dealership frames are included.